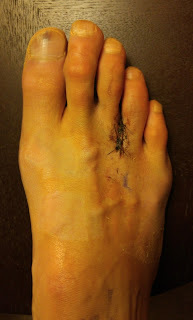 This past Friday, January 8, 2016, I had surgery on my right foot to remove a Morton's Neuroma that has plagued me for nearly a decade. At first, for many years, the neuroma discomfort was gradual and infrequent but as time went on, it got more painful at more frequent intervals. For many years I didn't know what the cause of the pain was and figured I just had less "padding" (skin and fat) on the ball of my right foot so I avoided walking barefoot because it was uncomfortable. Every now and then, typically while on trail runs on slickrock or really rocky trails, the neuroma would flare up and I'd be forced to stop every few miles, take my shoe off and massage my foot and toes for about five minutes at a time to get feeling back in my toes and clear the pain for bit. It worked but was annoying to have to stop frequently to take care of the issue. Then, while running the Mogollon Monster 100 mile race (MOG100) in September 2015, the pain came on around mile 14 making for a VERY long 100 mile race with frequent shoe changes (that didn't really help) and many stops to massage my foot. My guess is because the MOG100 course is so rocky, the rocks beat my feet up quite a bit. That was the final straw...I had to figure out what was going on. A few weeks later I went to see a local podiatrist, Dr. Sauer, that had surgically shortened a toe on the same foot way back in April 2004. By the time I went into see Dr. Sauer, I had self-diagnosed myself with Morton's Neuroma after my friend Andy had suggested that may be what I had. Dr. Sauer was quick to come to the same conclusion and had me try three cortisone shots over about six weeks. The shots didn't really bring any serious relief and I was fed up with the pain so I opted for surgery. It's been five days since the surgery now and I wanted to document the surgery and my recovery a bit. On Friday morning, the surgery went very well and took about an hour. The neuroma was "quite sizable". The surgery took place in the morning and I was out of the hospital by noon and back home on the couch for the rest of the day. I kept my foot elevated and enjoyed some solid couch time. 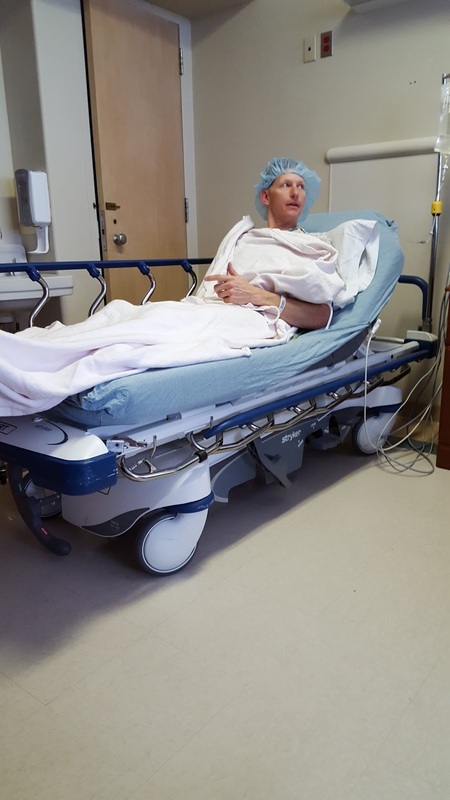 Dr. Sauer placed a "suction drain" in the incision area to help drain excess fluid and keep swelling to a minimum. I had done a good bit of internet research about this surgery and the experiences of others. I hadn't read about anyone else getting a suction drain but considering I felt no post-op pain at all, I'm pretty sold on the idea of the drain. The afternoon and night of the surgery I took two Percocet pills thinking my foot should start hurting and I wanted to "stay ahead of the pain." As it would turn out, I never felt any post-op pain at all and that would be the only pain pills I took. The rest of the weekend I spent chilling out on the couch watching NFL playoff football with my foot elevated. My foot was in a velcro boot so I could hobble around quite well. Monday morning I went to see Dr. Sauer to have the suction drain removed. It was painless and quick...just a quick snip of the suture holding it in and a fast pull of the drain tube from the incision. As soon as the drain tube was out, I was able to ditch the boot and slip my foot into my Altra Olympus shoes. 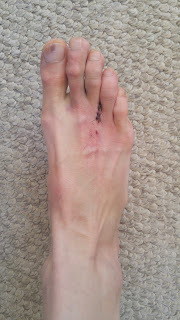 The wide forefoot and maximum cushion of the Altra shoes worked well for my beat up foot. It was nice to only be in the boot a few days. Now five days post-op I'm walking around pretty well but with a small "hitch in my giddy-up." But really I'm very pleased with the recovery thus far. Having no pain post-op and being able to get around with only a small limp is encouraging. The stitches will be removed eleven days from now and I'm hopeful by then I'll be walking normally and able to hike trails a bit. One week after surgery I was able to walk pretty normally in my wide, maximally cushioned Altra shoes but still used hiking poles for added stability on trails. 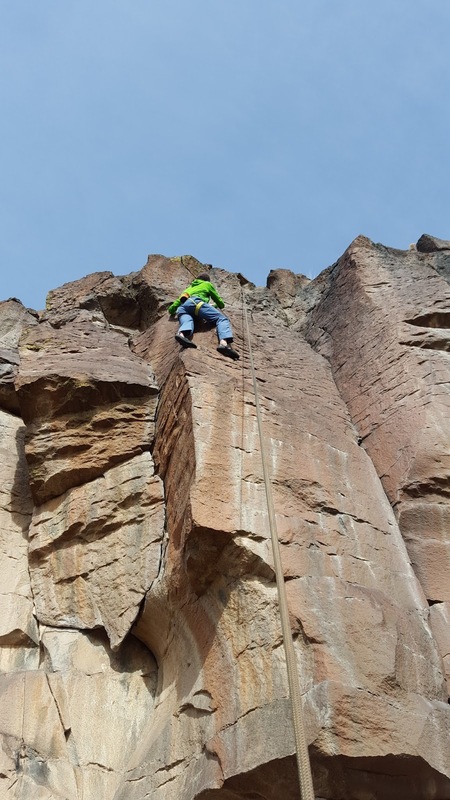 My wife and I even did a little rock climbing and climbed one easy route, on top rope, without any major discomfort. On the eighth day I was able to stop dressing the stitches and drain incision with gauze because it finally healed up enough. Eight days post-op I began walking without thinking about my foot and didn't feel the need to modify my stride to avoid rocking up on the ball of my foot. Other than some slight discomfort the first few steps out of bed in the morning, walking was quite comfortable with a slight "bruised" feeling in the ball of my foot when I walked. Ten days post-op I went rock climbing again, using bigger, more comfortable climbing shoes and this felt very reasonable. 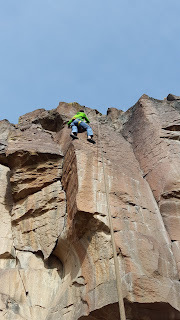 I was able to lead climb and not worry about my foot much. 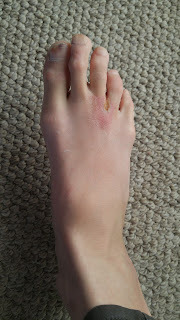 In fact, I think climbing is good therapy because the weight is mostly on my big toe and each step is very calculated. Eleven days post-op I did a short run of about a half mile en route to the gym to do some spinning on a stationary bike. I did the spinning with the pedal placed in the arch of my foot to avoid putting too much pressure on the ball of my foot. It felt great to work up a sweat again! February 10, 2016 - Well, four weeks post surgery (February 8th), I decided to try a short run to see how it felt. My short run turned into about four miles because it felt pretty good. 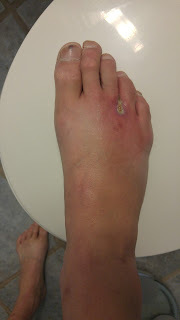 Unfortunately, a day after that run my forefoot was swollen, painful and, apparently, infected. I'm not sure the running had anything to do with the infection but the timing seems awfully coincidental. 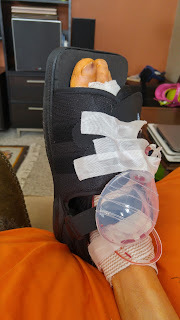 Also, though, I'm sure I had gotten the incision site dirty a couple weeks post-op by wearing sandals so the combo of all of this sure spells disaster. 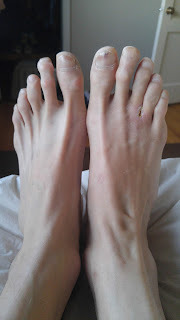 So after a week or so of walking quite normally without pain, I'm back to swollen foot with pain and limping around. I'm doing a few epsom salt bath soaks on my foot daily and started on antibiotics (Cephalexin) yesterday to help clear the infection. Lesson learned: Even though my foot was feeling quite good, four weeks post-op isn't enough recovery time for me to start running again. Also, I should have been better about keeping the incision clean. Drats. My theory now is that I contracted the staph infection by showering in the public shower at work after my run four weeks post-op. February 22, 2016 - After the ten day course of Keflex (Cephalexin) my foot was feeling better and less swollen. I thought the antibiotics may had done the trick. I finished the antibiotics on Tuesday morning, 2/16. But by Thursday night, the incision area was red and swollen a bit again. 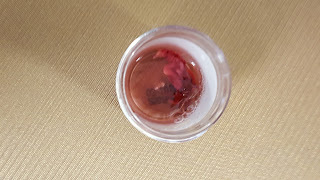 I went back in to the doctor on Friday morning where he took a culture of the fluid (there was a still a small slit in the incision that had been draining fluid a bit.) I went back on Keflex starting that morning, 2/19, and back to the Epsom salt foot baths a few times a day. The Keflex made a difference and the area felt better through the weekend but now, Monday morning, it's feeling pretty tender and a bit swollen. I go into a follow-up appointment in a couple hours to hopefully find out the results of the culture. For the first time since the surgery, I'm starting to feel bouts of anxiety and worry--feelings I don't generally ever experience. 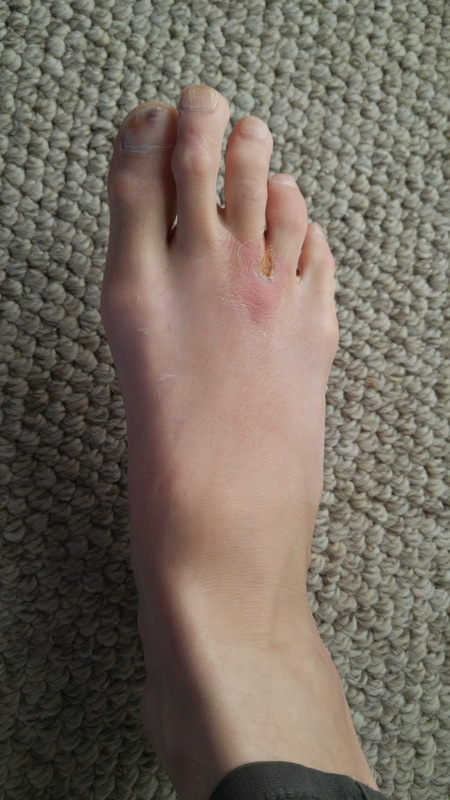 I'm starting to worry things are really not good and I don't know what that means for my foot and long-term foot health. In a word, I'm scared. February 24, 2016 - It turns out the culture of the fluid showed a staph infection. 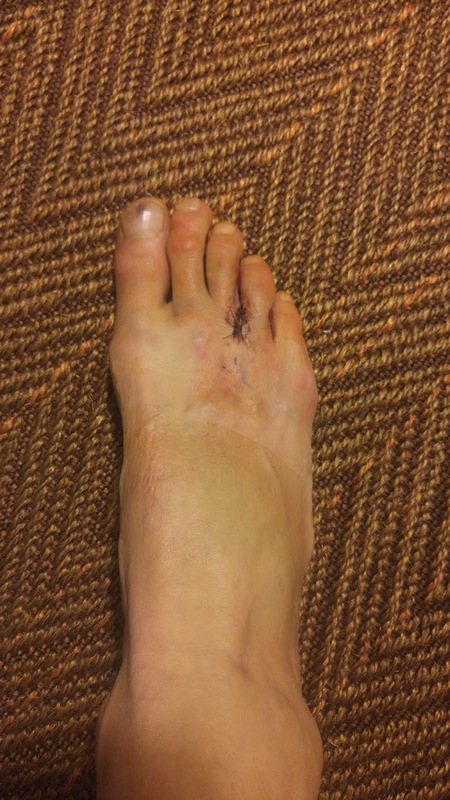 On 2/22/2016 the podiatrist removed the scab from the incision and we found it wasn't very well healed deep down. He did a little bit of cleaning and now we're treating it as an open wound. It's possible the stitches were removed a bit too early to allow it ample healing time but I'm guessing I got the incision dirty (bad patient!) so it's my fault. For now I'm applying Silvadene ointment twice daily and keeping it covered with a breathable gauze pad. I'll also continue on the second round of Keflex until it's done. In the past two days I haven't really noticed an improvement but it hasn't gotten worse. There's still mild swelling in the forefoot and the area around the incision is red and tender. The area isn't shrinking but not enlarging either. At this point I'm beginning to regret having the surgery. It's been nearly seven weeks and the healing has been poor. I'm wondering if I'll be able to run this spring, or summer, and with Hardrock and PTL on my schedule, it's rather depressing to think about. March 10, 2016 - Right about eight weeks post-op I felt a noticeable change in the healing and, finally, felt encouraged that the worst was behind me. The swelling in the foot was all but gone in the morning, right out of bed, and minimal by the end of the day. 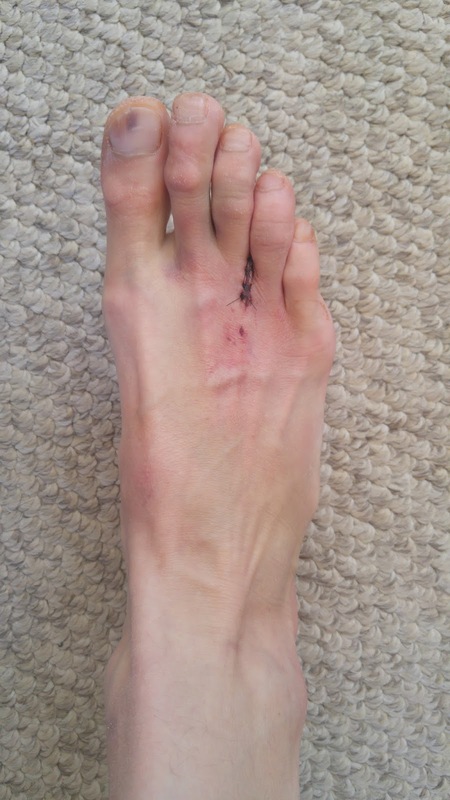 My podiatrist concurred that the healing was looking very encouraging and gave me the go-ahead to start running again. I still gave it another five days before going for my first trail run since the surgery on January 8. Eight weeks post-op (four weeks post-infection.) Side by side comparison. 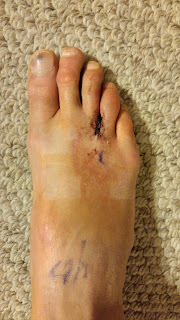 Note the reduced redness around the healing incision site and the definition in the top of the foot again. I can actually see the tendons! March 16, 2016 - Hopefully the last update to this continuing saga and blog post! I've run the past three days in a row with no foot pain at all. I can tell it's feeling good because I don't think about it or notice it while running. I'm claiming victory at this point even though there's still some healing taking place at the incision and a scab persists. The swelling and redness are all but gone now. I really do think I would have been at this point by week five post-op had I not incurred the staph infection. That set my healing back by three weeks and was pretty scary. I haven't run long enough yet, nor on technical enough trails, to know if the neuroma pain is completely gone but I'm hopeful it will be. Once I go for my first long, tough trail run, I'll update this blog post once more. January 19, 2017 - It's been just over a year and I wanted to add a yearly follow-up. In a nutshell, I'm very glad I went through the surgery. I haven't felt any sign of neuroma pain in my foot in many month. In June 2016, six months after surgery, I ran the San Juan Solstice 50 Mile trail race. In July I ran the Hardrock Hundred 100 mile trail race and in August I ran a 165 miles around Mont Blanc in France and never once experienced any concerning foot pain. My story is a success story. If you're experiencing neuroma pain, I hope you're able to find a fix as I did.